Yesterday I mentioned I would show you the “cafe” and “post office” areas of the playroom but I decided to go the other direction around the room–so that will be tomorrow. Today let’s take a look at where the kids and I often hang out to relax–complete with bookshelves full of books, pillows and bean bags, and our new Expedia Tv unit for movies and games. This one happens to be discontinued but here is a very similar version. (And because it is new I haven’t finished filling it and of course labeling it. 🙂 As of right now movies and Wii games are in the top green boxes (away from little hands). The bottom bins are somewhat-filled with little toys that are just easiest played by dumping them out and then scooping them back up when finished. That will be a whole other post–once I get it figured out. On the wall to the left of the TV wall is what we consider our “Word Wall”. (You can take the teacher out of the classroom but you can’t take the classroom out of the teacher. 🙂 The background paper is actually a bunch of scrapbook paper that I stuck to the wall with poster strips. I found a similar idea online here and fell in love–especially with the price tag. I decided it needed a little separation between the blocks of color though so I hot-glued some ribbon to the paper. Then I stuck on the letters I found a few years ago at Land of Nod. (Sorry, they are discontinued too but here are some other possible options. Then we stick on words (from my teaching days) that my daughter is learning to read and write. On the other wall are tissue paper flowers that are actually very easy to make. Today’s Daily Tip: A room doesn’t have to be expensive to be beautiful. There are so many inexpensive ways to make a big impact. The word wall and tissue paper flowers probably cost me altogether $30. I love how such a little amount of money and minimal effort really adds a pop of color and sets a playful tone. These are particular ideas for a playroom or child’s room but there are so many ideas out there for every kind of space. You just have to look–and don’t be afraid to use a little imagination. Pinterest is full of them. If you haven’t checked that out yet you need to—but only if you have some time to kill. It is so easy to lose track of time with so much talent out there. 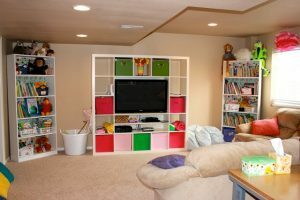 Basement Playroom–and a little spot for mom.